Trust in Our Mother of Perpetual Help’s unfailing intercession has spread like wildfire in Nigeria ever since Redemptorist missionaries first arrived in 1987. 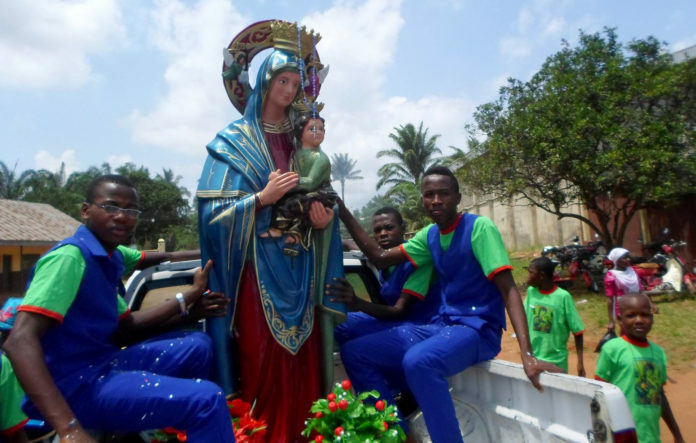 Her feast day on June 27 has evolved into a major annual celebration, this year attracting an estimated 18,000 people – many of whom traveled for days and wore special clothes made from material imprinted with the image of Our Mother of Perpetual Help. 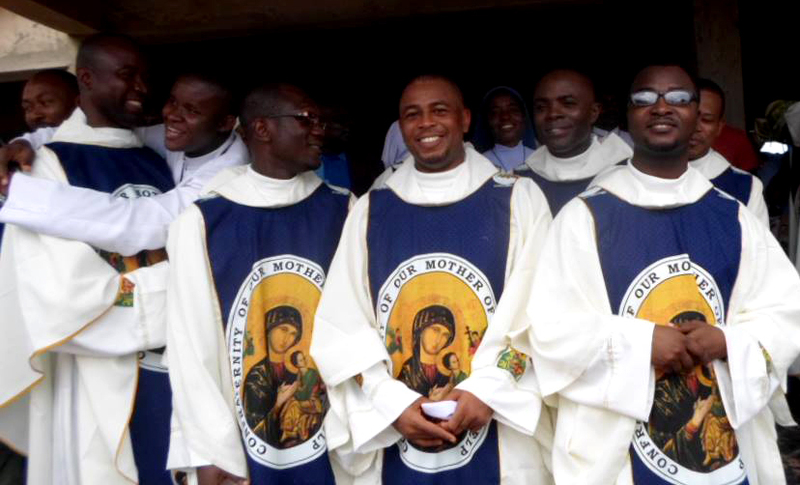 Archbishop Mathew Man-Oso Ndagoso of the Archdiocese of Kaduna presided at the all-day celebration held in a mini stadium in Lagos as the dancing crowd cheered and waved white handkerchiefs to celebrate the inauguration of the Jubilee Year of Our Mother of Perpetual Help. 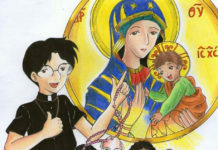 The faithful eagerly awaited veneration of Our Mother of Perpetual Help, for they believe that they leave all their problems as well as their thanksgiving for her assistance as they touch her image and pray. 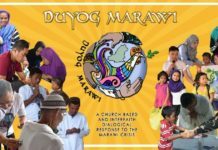 Each person comes forward with faith and expectation, for they have seen miracles in the lives of their neighbors and trust that if she has helped so many others, she certainly will help them. 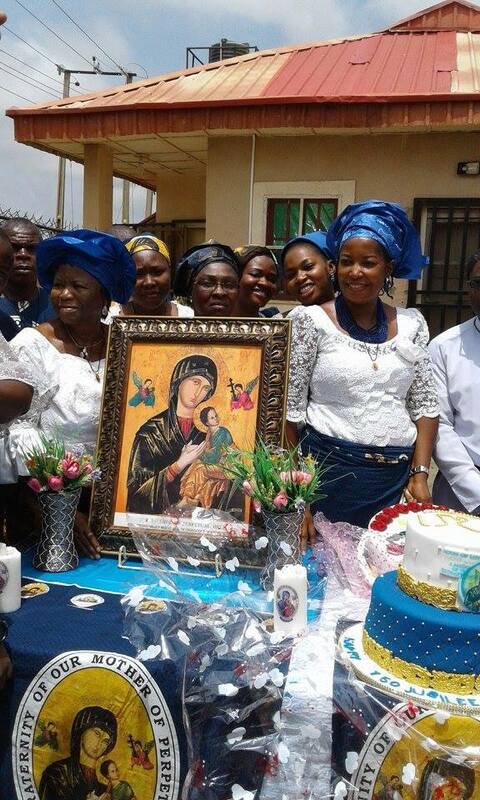 Devotion to Our Mother of Perpetual Help is at an all-time high, as Redemptorists in Nigeria celebrated the completion of Our Mother of Perpetual Help Catholic Church in Amuwo Odofin, Lagos. Fr. Henry Ogbonna, C.Ss.R. and Fr. Philip Obasi, C.Ss.R. 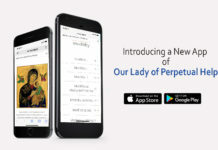 instituted a 21-Day Fasting and Prayer Program in January 2014, which is credited for inspiring both the pastoral team and parishioners to accomplish their goals: completing the church building; paving and landscaping the compound; and building a stone grotto in honor of Our Mother of Perpetual Help. Vice Provincial Superior Kingsley Onyekuru and more than 30 Redemptorists of the Vice Province of Nigeria joined parishioners and many diocesan priests and religious men and women for a celebration of praise and thanksgiving as Archbishop Dr. Alfred Adewale Martins of the Metropolitan See of Lagos dedicated the new church and grotto.